Relying on a piece of string to prevent you falling to your death while completing a variety of tasks isn’t considered everyone’s cup of tea but, for the Industrial Rope Access qualified team at Adventure Southland, it’s another fun day out hanging in the harness. Our team were approached some time ago about completing a few hard to reach jobs as an alternative to other means of access that were either too costly or too difficult. Because we were well versed in not falling off things on purpose and could tie a Figure 8 knot, employers thought ‘why not see if Adventure Southland can access it?’. We managed not to fall and proved to be efficient and hard working. Since then, we have completed regular maintenance work for Ballance Agri-Nutrients, Alliance Group, Daiken Southland, Splash Palace, Open Country and Invercargill City Council. Initially, idea of using our climbing/mountaineering background to assist in completing a large variety of maintenance jobs around the country was a very exciting prospect. As this work become more regular, our team completed IRANNZ Rope Access qualifications. This has been a huge asset to Adventure Southland, opening up more avenues of work within the industrial sector. 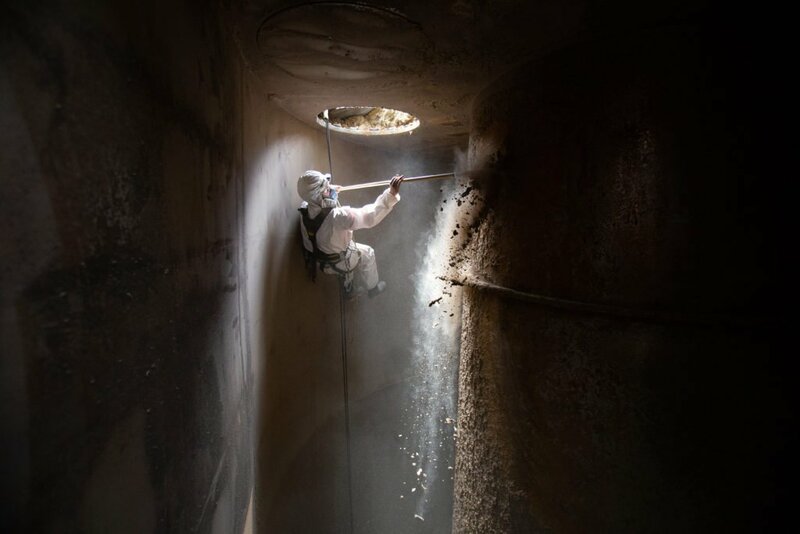 On top of doing the dirty work, we are now sharing our broad knowledge of Rope Access, Confined Spaces and Height Safety through training programmes from Auckland to Bluff. Our courses can be tailored to specific clients, and employers can choose whether they require unit standards or a best practice equivalent course. We recommend our clients refresh their knowledge every two years to ensure they’re operating to current best practice guidelines. It’s great to revisit past clients and see how their training is being utilised in the field, and making sure they make it safely home from the worksite. We also inspect Fall Arrest equipment used by rescue teams and maintenance workers, etc. Because our guys are using the gear on a daily basis, we have practical knowledge so are able to supply the right kit for the job, ensure employees are confident in using it, and make sure it’s safe to use when needed. Much of our expertise transfers well to the recreational branch of Adventure Southland. Our team enjoys learning new skills, the challenge of difficult setups, managing hazards, and gaining better understanding of different variations in system and kit. The guys are always learning and growing, and the variety of being inside a huge chimney, hanging off the roof of the Southland Museum, or inspecting a bridge always keeps the job interesting. It’s on the unusual and difficult access jobs when the team come into their own. We know it isn’t always practical to use machinery or scaffolding to gain access. If you’re ever wondering “how am I going reach that?” or “how could we get there?”’ then it’s a good time to ring us and have a chat about potential options. Whether it is cleaning gutters on residential or commercial industrial sites, roof maintenance, window cleaning, painting or completing assessments in hard to reach areas, if there’s an excuse to utilise our rope skills the team is keen!